Ever since I posted the last blog entry on the subject of law school women leadership programs, I have been getting “push back” from some of my readers. Not the kind of push back you would expect, however. 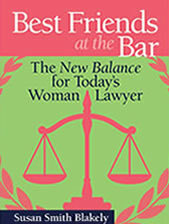 The readers I have heard from are my friends and colleagues who know about my books and the Best Friends at the Bar project. They want to know why I failed to tell you how I can fit into these women leadership programs. They rightfully point out that I failed to market my services and tell my readers how I can help those readers and their groups. They say that I am failing to do one of the things that I drive home with young women lawyers at every opportunity—-that is, to market yourself. I concede the point, but I have to say that I do see a distinction between marketing to colleagues, clients and potential clients and marketing to the entire Internet. Admittedly, I am a bit shy about self promotion in this venue, and I have to get over that. A basic tenet of genuine and effective self promotion is that it is good for both parties. One party has something of value to provide as a service, and that service will benefit the other party. If the second party does not understand the benefit, that party does not stand to be benefited. It is as simple as that. Yes, I do speak at programs for women law students and lawyers all over the country. I speak at law schools, law firms and law organizations. I even have spoken at the federal court to an audience of judges and law clerks. Every speech that I give includes leadership skills, the importance of women leaders in all law practice settings, and the responsibility of women in our profession to become mentors to younger and less experienced women lawyers on the subjects of skill building and leadership. 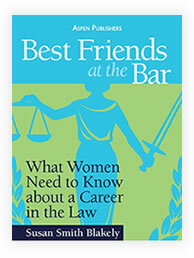 Those subjects are addressed in my first book, Best Friends at the Bar: What Women Need to Know about a Career in the Law, and it will be addressed in my second book on the new balance for today’s woman lawyer, which will be released by Aspen Publishers later this year. These are very important subjects, and I would be remiss not to include them and emphasize them in what I write and the speeches I give. Not only do I speak on the subjects, but I would love the opportunity to speak at your law school, law firm or law organization. Your group would be joining some of the most prestigious law schools, law firms and law organizations where I have spoken and had my programs enthusiastically received. If you are interested, click on the “Contact” tab on my website (www.bestfriendsatthebar.com) to speak to me about the possibilities. So, there, I did it! Thank you to my loyal followers for woodshedding me on this matter. 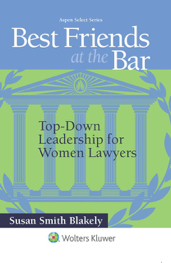 Women lawyers are not necessarily good self promoters, but do it we must. 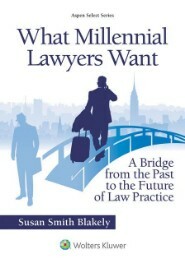 This entry was posted in Career Counselors, Law Students, Practice Advice, Young Lawyer. Bookmark the permalink.